A full day of fun and action, featuring a BBQ and evening talk from local cycling icon and round the world cyclist Imran Mughal. Stay for the day or drop in and go away! Meet some of Bradford’s many cycling organisations. Everyone is welcome who wants to hear an inspirational speaker or is interested in the benefits of cycling for fun, health and wellbeing. Oh – and ping pong tables are available all day. All events are pay as you feel, donations welcome! Food is ‘pot-luck’ with some provided (contribution of a dish or a bottle are invited). Under 18’s must be accompanied by an adult. Come along and help us strip useful parts from bikes that we’re unable to repair and learn about bikes and workshop tools. if you don’t have any experience this is a good opportunity to get your hands dirty as it doesn’t matter if you mess something up! There are plenty of other things around the hub that need doing if you’re in the mood to volunteer your help. A bring and share social lunch. Dazzle us with your culinary delights or simply grab something from a local shop. 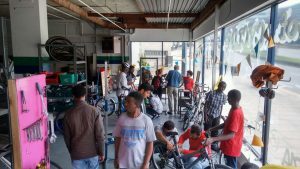 Bring along your bike to fix or fine tune or help fix some of the many broken bikes for other potential cyclists in need. Use our workstands and tools with the support of our friendly mechanics. A great opportunity to learn a bit whilst helping recycle bikes saved from landfill. We have second hand parts and consumables such as brake blocks and cables. We light the BBQ in Bradford’s most secret ‘garden’. All clubs and organisations in the district with an interest in bikes are invited to present their publicity and media materials. (Contact info@capitalofcycling.org if you want to book a space or screen a short film). Learn about local cycling organisations, see what they can offer you or how you can help them. 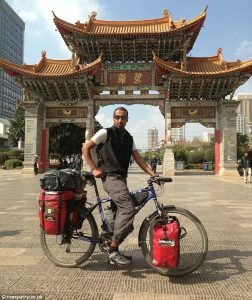 Local round the world cyclist Imran Mughal spent 15 months cycling 25,000 miles through 33 countries after being made redundant. He survived a terrifying ordeal at gunpoint in Bosnia, deadly spiders in the Australian outback and 53-degree heat in the Oman desert and cycling through monsoons in Indonesia. To round off the day we are showing Bikes Vs Cars. This compelling documentary gives testimony to the environmental impact of cars and the transport solutions offered by cycling. Address: Bradford Capital of Cycling, Hall Ings, BD1 5SD (directly behind the interchange, under the NCP car park, next door to The Bradford Hotel).